Whether you’re still in school or fresh out of college, a web design internship is a really great way of learning the ins and outs of a creative agency. It’s a lot of work, of course, and it’s not always glamorous, but the opportunities to grow are endless. In my years of experience, there are a few main things every design student or intern should take away. Take a look and drop us a line at @wdgtweet. After having the opportunity to sit in on meetings and client calls, you’ll be able to catch a glimpse of how much work it takes for a whole team of talented individuals to piece together finalized deliverables. Design school spoils you with generous deadlines for projects. One of the first lessons you’ll learn is to take all that design knowledge and skill, and kick them into high gear. Adjusting to a faster pace may be difficult at first, but ultimately, rewarding. Don’t be afraid to speak up and ask for help or show curiosity. Utilize the skills and helpful advice of your coworkers if you lose some creative steam. Learn to listen to helpful feedback and take suggestions with a grain of salt. Be open-minded to new ideas and combining ideas, but sometimes giving the client what they want is inevitable. Show enthusiasm and interest in projects you present, even if it’s not your best work. The design field is constantly changing. It’s super beneficial to keep up with trends and practice the basics. I use any free time to read blogs, bookmark helpful sites, and pick the brains of the creatives around me for advice. The purpose of a web design internship is for you to learn and to help the company to the best of your ability. In your web design internship, no one expects you to be an expert in your field just yet. Challenge yourself to turn your design weaknesses into strong skills. Go above and beyond what you are required to do. Learn to be indispensable and seek opportunities to help out in any way you can even if a task is not under your job description. Other than skill level, more experienced designers have a stronger ability to make design choices with purpose and communicate their work effectively to win the hearts of clients. 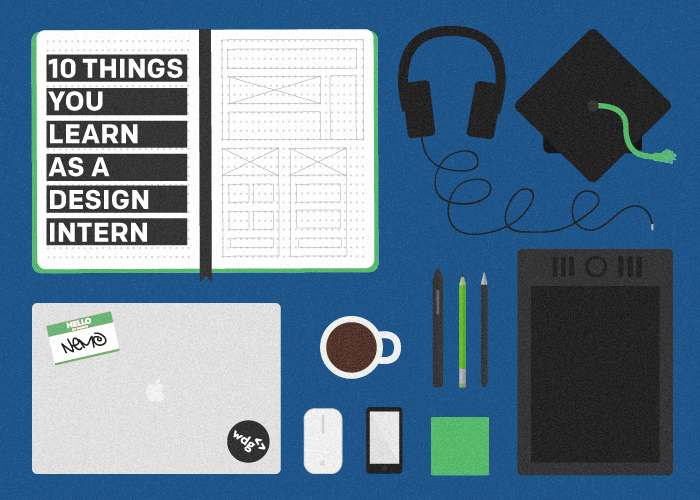 There are a ton of specializations in the design field. Maybe you dreamed of being a visual designer, when you actually find yourself loving information architecture. During your web design internship, find out what you like and what you don’t like. Expose yourself to different roles and practice.